Early word on 1999’s The Iron Giant - an adaptation of Ted Hughes' 1968 novel - said it was terrific, and when it hit the screens, the critics agreed. 1999 offered a lot of well-received animated movies, but Giant got some of the best notices of them all. Toy Story 2 may actually have surpassed its critical approval, though. Unfortunately, audiences didn't notice the plaudits for Giant and it suffered an ignominious fate. Despite all the glowing reviews and the ecstatic word of mouth, nothing could save the film at the box office. After an anemic gross of about $23 million, the movie disappeared from theaters. Gone, but not forgotten, as Giant maintains an avid fan base who continue to proselytize about the movie. I don't know how it's done on home video, but I'd guess fairly well, and I'd be surprised if it hasn't fared better than would expect from such a box office bomb. Set in Maine circa 1957, young Hogarth Hughes (voiced by Eli Marienthal) lives with his widow mother Annie (Jennifer Aniston). Obsessed with sci-fi and monsters, Hogarth makes a new pal when a metallic alien lands on the Maine coast. This friendship comes with travails, though, as the Iron Giant (Vin Diesel) attracts unwanted attention. 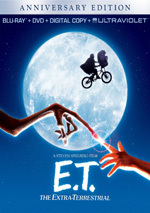 In particular, US Government Agent Kent Mansley (Christopher McDonald) seeks the Giant and views the alien as a threat. We follow the bond between Hogarth and the Giant as well as the obstacles they face. One problem created by all Giant’s raves is that they set up the viewer for an experience that the film itself may not be able to match. That's the danger of hype, and although it was small-scale for Giant, the film received a lot of secondary buildup nonetheless. That was my position when I saw the movie theatrically. As a result, while I enjoyed the film, I couldn't help but wonder why it received such acclaim. It was a well-executed picture but I didn't think it was anything special. On subsequent viewings, my opinion hasn't changed radically, but I definitely like the movie more. It still isn't one of the all-time great animated films, but it offers a charming, fast-paced, witty and moving little fable. I think the movie offers excellent voice acting. The cast includes a nice complement of different folks who all add up to one terrific bunch. We get Aniston playing against type as the mother of our protagonist Hogarth, plus Harry Connick Jr. working with type - but still effectively - as beatnik artist Dean. McDonald does well as government heavy Kent Mansley, and John Mahoney succeeds as military not-so-heavy General Rogarde. All are splendid. Our two main characters fare best, though. Initially I figured Diesel’s vocals went through massive amounts of electronic reworking to seem so “metallic”, but as I learned through the disc’s extras, that’s not totally true. Oh, there's definitely been some sweetening, but Diesel does most of gravelly voice without help. It's a great performance that adds a lot of charm and character to the Giant. The animation in The Iron Giant isn't the best you'll see, but it's very good in its minimalist style. It serves the piece nicely and creates a distinctive atmosphere. Some of the best aspects of the animation relate to the Giant himself. The Giant displays excellent character design, as all at once, he can seem adorable, ominous and intelligent. Despite my initial misgivings, I now find The Iron Giant to be a satisfying and enjoyable little film. I join the chorus of folks who don't understand why it did so badly at the box office: the movie's a treat. 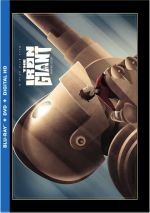 The Iron Giant appears in both an aspect ratio of approximately 2.40:1 on this Blu-ray Disc. Across the board, the movie looked great. Sharpness seemed consistently strong. Only a sliver of softness interfered on a couple of occasions, so 99 percent of the time, the film remained concise and well-defined. No issues with jagged edges or shimmering occurred, and I also noticed no edge enhancement. Print flaws remained absent, as the movie failed to display any specks, marks, or other concerns. Giant featured a broad and mostly rustic palette that highlighted reds and oranges. Along with the occasional glimpse of “futuristic” blues, we got forest greens, and the colors always appeared excellent. The hues always came across as firm and dynamic. Blacks looked deep and dense, while low-light situations appeared smooth and well-delineated. Overall, I thought Giant offered an excellent transfer. 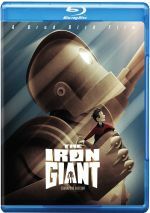 The DTS-HD MA 5.1 soundtrack of The Iron Giant succeeded as well. The forward soundstage appeared well-defined and audio seemed neatly placed. Some smooth panning could be heard, and the entire package blended well. The track didn’t use the surrounds relentlessly, but they added some useful auditory information and meshed well with the proceedings. Action scenes offered the most involving use of the rear speakers, and those contributed good pep to the tale. Even quieter moments seemed smooth and well-blended, though. Audio quality worked well. Speech appeared natural and concise, without edginess or other issues. The music fared well, so Michael Kamen's score came across as clear and crisp. Effects were nicely realistic and detailed, and they presented some deep bass. Low-end was tight and distinctive, so that side of matters packed a punch. Overall, this became a largely effective auditory presentation. How did the Blu-ray compare to the 2004 SE DVD? Audio seemed smoother and more dynamic, with a clear improvement related to speech. I found the DVD’s dialogue to seem dull and muddy, but vocals fared well here. Visuals showed another step up in quality. While I felt pleased with the DVD’s transfer, it couldn’t compete with the tight, vivid image seen here. Both sound and picture became more impressive on the Blu-ray. The Blu-ray mixes old and new extras, and we find two versions of the film. In addition to the Theatrical Cut (1:26:39), we get a Signature Edition (1:29:58). The longer take adds two scenes. The first new sequence pops up at 15:50 and lets us see a short chat between Dean and Annie in the diner. The second occurs at 55:00 and shows a nightmare experienced by the Giant. Do either of these improve the film? Not really. The diner sequence seems too brief to contribute much, while the dream simply reinforces notions we understand elsewhere. Neither segment hurts the movie, but they don’t make it better either. Next we get an audio commentary from director Brad Bird, head of animation Tony Fucile, story department head Jeff Lynch and storyboard artist Steven Markowski, all of whom sit together for this running, screen-specific piece. Bird takes the helm here and dominates the discussion. The commentary covers topics such as visual design, influences and inspirations, characters and cast, animation challenges, story issues, and cuts and alterations made to the original plans. Given the personnel involved, one might expect a technical bent to the track, and one would assume correctly. However, the piece doesn’t become dry or stiff. It moves briskly enough and goes over a lot of interesting issues. It’s not one of the best animation commentaries I’ve heard, but it explores appropriate topics nicely and proves useful. Note that if you select the “Signature Edition”, a commentary option provides notes from Bird during the brief added scenes. He gives us a smattering of details about the two cut sequences. A “branching” option on the 2004 DVD, Behind the Armor offers six clips. The pieces run a total of 17 minutes, 31 seconds. These include remarks from Bird, Lynch, animatic artist Andrew Jimenez, designer Joe Johnston, production designer Mark Whiting, screenwriter Tim McCanlies, producers Allison Abbate and Des MacAnuff, storyboard artists Mark Andrews and Kevin O’Brien, and animator Dean Wellins. The participants chat about the film’s new Warner Animation logo, character design, the book’s path to the screen and changes along the way, bringing personality to the Giant, storyboards and animatics, and creating the battle sequence and limitations involved. Six Additional Scenes appear, all of which come with introductions from Bird. Including those intros, the “Additional Scenes” last 15 minutes, 16 seconds. Most come in the form of animatics, though a few feature rough pencil animation. Some nice sequences appear that flesh out the characters and situations. None of them seem revelatory, but they’re fun to see. The intros add some useful production notes, though Bird doesn’t always tell us why the snippets failed to make the final film. Note that the Blu-ray loses two deleted scenes from the DVD. However, these appear in the “Signature Edition”, so they still pop up on the disc. I’d like to have them on their own, though. A featurette about Teddy Newton of the storyboard department, The X Factor fills five minutes, 38 seconds. We get notes from Lynch and Bird as they talk of Newton’s talents, and we then see an example of a blind date story reel he created. It’s very odd and doesn’t connect to the final movie at all. It’s entertaining, though, and an interesting extra. Next we get a little information about the Duck and Cover Sequence. It runs two minutes, 23 seconds and presents comments from Newton. He tells us his inspirations and aims for the little film within the film. We see the original story reel as well in this brief but nice piece. Under The Voices of The Iron Giant, we get five clips: “The Voice of the Giant” (2:39), “Hogarth Hughes” (2:01), “Dean McCoppin” (1:11), “Annie Hughes” (1:04) and “Kent Mansley” (1:20). Across these, we hear from Bird, Fucile, Abbate, animator James Van Der Keyl and actor Vin Diesel. These look at character design as well as Diesel’s performance. It would’ve been nice to hear from more actors, but we still get good info here. Under The Score, we get a four-minute, 49-second collection of snippets. These feature composer Michael Kamen as he discusses his work. We locate useful notes from Kamen. Titled The Motion Gallery, this four-minute, 22-second feature mostly presents filmed versions of stills. Some movie snippets pop up as well, and those differentiate it from a standard static gallery. Mostly we see various forms of preparatory art, from character sketches to storyboards to backgrounds. Some rough animation and animatics appear as well, and the movie snippets allow us to compare the final product to the early renditions. Plenty of cool material shows up here, but the presentation doesn’t work for me. It gives us the art in a disjointed manner. From the 1999 DVD, we locate some Easter Eggs. This section runs one minute, 48 seconds and depicts a letter from author Ted Hughes to producer Allison Abbate and animated outtakes. These offer minor bits of interest. Two more featurettes follow. The Salt Mines goes for seven minutes, six seconds and shows the discovery/unearthing of the film’s original art. Hand Drawn fills one minute, 40 second and talks out the essentially dead art of cel animation. Both segments seem enjoyable enough but inconsequential. Another piece from the 1999 DVD, The Making of The Iron Giant occupies 22 minutes, five seconds. It delivers comments from Bird, Diesel, Abbate, Wellins, animators Jennifer Cardon and Ricardo Curtis, artistic coordinator Scott Johnston, head of background Dennis Venizelos, art director Alan Bodner, and actors Jennifer Aniston, Eli Marienthal, Harry Connick Jr., Christopher McDonald, and John Mahoney. We learn about story/characters, cast and performances, design and animation, music and influences. Created as a promotional tool, “Making” lacks much substance. New to the Blu-ray, The Giant’s Dream goes for 55 minutes, 47 seconds. It provides material from Bird, O’Brien, Andrews, Abbate, Cardon, Wellins, Lynch, Johnston, Whiting, Jimenez, Markowski, former Disney colleague John Musker, animator Adam Burke, former Warner Bros. Feature Animation president Max Howard, former Warner Bros. Pictures worldwide production president Lorenzo di Bonaventura, supervising animator Chris Sauve, associate producer John Walker, artistic coordinator Scott F. Johnston, Ain’t It Cool News’ Drew McWeeny, and filmmaker Guillermo Del Toro. Most retrospective documentaries take a happy, chipper viewpoint. “Dream” does the opposite, as it focuses on the many problems that occurred during the project, and it gets into Bird’s personal challenges as well. These factors take “Dream” to a much higher level than expected. How often do you hear a producer say that she hated working with a director? Almost never, and with a consistently blunt, honest feel, “Dream” turns into an excellent program. Finally, the disc includes two trailers. We get a promo for the movie’s “Signature Edition” plus the “Brad Bird trailer”. The disc doesn’t explain this feature, but we can assume it’s an ad assembled by the director himself. We lose the film’s theatrical promo from earlier releases. 17 years after its release, The Iron Giant remains a delightful and charming film. It stands up to repeated screenings and continues to entertain. The Blu-ray brings us excellent picture and supplements as well as strong audio. A terrific release for a fine movie, this Blu-ray earns my recommendation.